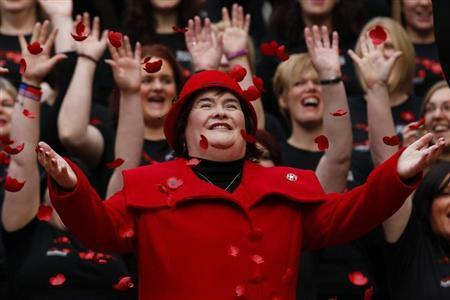 (Reuters) - Scottish singer Susan Boyle says she has a form of autism known as Asperger's syndrome, a diagnosis she says came as a relief after years of believing she had brain damage. Boyle, 52, told the Observer newspaper in an interview published Saturday she had sought help from a Scottish specialist a year ago believing her childhood diagnosis of brain damage was incorrect. Boyle said she had been teased throughout her life for her unusual behavior and was called "Susie Simple" by children in her hometown of Blackburn, Scotland. She had kept secret for the past year that she was diagnosed with Asperger's, a mild form of autism marked by social awkwardness and narrow interests that can make relationships challenging. "I was told I had brain damage. I always knew it was an unfair label," she said. "Now I have a clearer understanding of what's wrong and I feel relieved and a bit more relaxed about myself." Boyle shot to international fame in 2009 after appearing on the variety TV show "Britain's Got Talent" and performing a flawless rendition of "I Dreamed a Dream" from the musical "Les Miserables." Her life story from unknown Scot to multimillion-selling recording artist has been made into a musical. Boyle told the Observer she visited the specialist on her own because "I thought I had a more serious illness and couldn't function properly." She said she was learning to manage her Asperger's and hoped the diagnosis would make people more empathetic. "I think people will treat me better because they will have a much greater understanding of who I am and why I do the things I do," she said.